Are you submitting your online application for IAS or any Public Service Commission like UPPCS and for this you urgently need to resize your Passport Size photo and signature pic but don’t know how to do it? Well slowly but definitely, India is adopting e-governance. Now almost all the major Government organizations are accepting job application through online mode. This means that the candidates must be smart enough to scan and resize their pictures for online Form submission. Basically, most online job submission sites want you to submit two images to them. The first one is your Passport size photo and the second one is the scanned image of your signature. In some cases (like the present demand from UPPCS) you are required to submit one single picture containing both your photo and signature combined. Scanning an image is quite easy given the number of options available in the market. You may also use any good smartphone to take a snap of your image and that of your signature to use it as a scanned image. On Android Market (now re-designated as Google Play), you can find lots of free (as well as paid) apps to scan your images. As such, I am not going to explain the process of scanning an image which is quite easy for most of the folks. The difficulty comes when you are asked to resize an image in a particular dimension i.e either in Pixel, Centimeter, Millimeter , Inches or Points. Normally a particular pixels size should be specified by all the websites. However, owing to absence of a uniform image submission policy, you may be asked to resize your image in any of the afore-quoted image dimensions i.e. either in pixels or in cm. So what is the quickest and best solution to re-size your images? Though, there have been many image editing software which can be used to resize an image, I am going to tell you about a free software which has been created specifically for the sole purpose of resizing an image in any of the dimension needed. It means that with the help of this software, you can resize an image in whatever metrics (pixels, cm, mm, Inches, points or Characters) you want. This software is Free Image Resizer Starter. Please don’t assume it a Trial version or starter edition of a full fledged software despite its name suggesting it. Though, in the beginning, the starter version was published to entice users to opt for Full version (which was paid), I don’t know whether this strategy was successful or not. 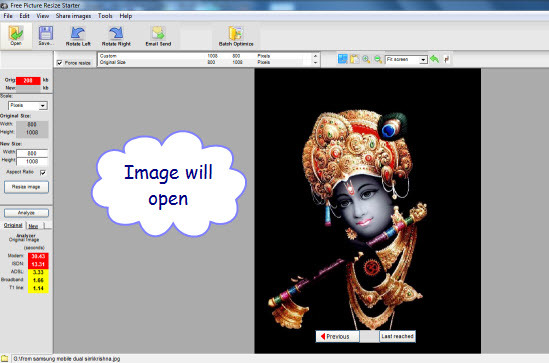 So how this software helps you to resize an image. 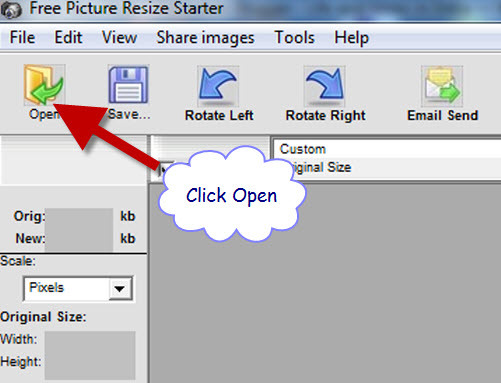 This software is a very handy tool for all your image resizing work. You can also save the image in any of the popular image format like Gif, Jpeg, PNG or Tiff by using this software. Unfortunately, the parent company Pictureresize.com is no longer in business and as such the official download site for this software is not available. However, I have arranged an alternate download for this software. You can download this software ( 4 MB in size) from this page.